JUST refurnished, 3rd floor with lift, air conditioning/heating, WIFI!!! 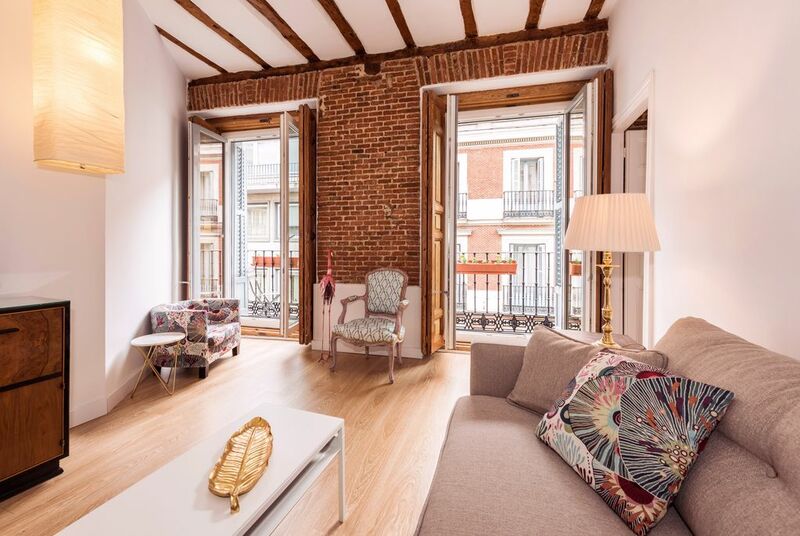 I am renting out my charming apartment PRADO SANTA ANA in Madrid. This is a fully renovated and newly furnished airy two bedroom, two bathroom apartment in a brick townhouse. The master bedroom has it's own bath while the second bedroom on the other side of the living room has a bath adjacent. It's fully furnished with a high end kitchen and bathrooms, and a washer/drying in the unit (yay!). This is the hottest area of Madrid to live at the moment, the subway is just down the block. This fully furnished apartment features exposed brick and stone walls and high ceilings. The decor is sleek and modern while maintaining a comfortable and welcoming feeling. “PRADO SANTA ANA” has 6 people capacity on a 3rd floor with small lift (up to 2 people). The gorgeous flat (70 square meters) is very bright where every room has a balcony. The apartment “PRADO SANTA ANA” is decorated in elegant colours to make the atmosphere more enjoyable. This apartment is exceptionally restful and functional with free wifi internet and air conditioning. The entrance hall leads into a living /dining area with TWO balconies facing out the street. It is furnished with on sofabed (up to 2 people), a wooden coffee table, a shelving with LCD TV and a wooden dining table. There are two bedrooms: 1 double (queen-sized bed 1.40m x 1.90m) and 1 single (2 single twin beds 0.90m x 1.90m). The living room has a sofa-bed up for 3 people. There are two bathrooms with walk-in shower. The kitchen modern and functional is fully equipped with fridge/freezer, oven, 4-ring ceramic hob, dishwasher, washing/drying machine. As small household-electric we can emphasize iron, cooker, water boiler, coffee machine, toaster, teapot, glasswork and set of dishes.PRADO SANTA ANA (calle Prado 25 , Madrid) is placed in a classic building of the zone of Spanish Parliament, 5 minutes walking to Puerta del Sol and underground, in the centre of the Paseo del Arte. The "PRADO SANTA ANA" opens out onto the most exuberant city, contemporary theatre and art you can enjoy in the museums near the apartment: the Museo del Prado, the Museo Reina Sofía and the Museo Thyssen-Bornemisza. Located on the well known Santa Ana Square, this is the perfect place for those who are willing to stay in the middle of Madrid´s historic and tourist centre. Although the apartment is surrounded by the most centric Metro stations, getting on the metro can be avoided. Within only a few minutes walk you can reach the main Museums (Reina Sofía, Prado, Thyssen), the most visited and emblematic tourist sites such as the Plaza Mayor, Puerta del Sol, Palacio Real or the Gran Vía –something like Madrid´s Broadway where you can find lots of theatres and cinemas- and neighbourhoods such as La Latina, famous for their cultural and night life and for the most important outdoor flea market El Rastro. Just cross the main door, walk any side down the street and Madrid is all there! "PRADO SANTA ANA" is in the heart of the Letters District, his name came from the famous writers who lived and worked there during XVI and XVII centuries. This district is one of the more attractive commercial areas of Madrid with theatres, restaurants, bars, coffees and hotels. Point of contact of tourists and students is the Plaza SANTA ANA, famous by his terraces and his glamorous nightlife. The Letters District is very close to PLAZA MAYOR and PUERTA del SOL ending on the Paseo del Prado where famous hotels PALACE and RITZ are placed. Enjoy the most emblematic works of Spanish and international art in the most important museums in Spain. Experience the most dynamic nightlife and taste the best tapas. Madrid is full of cultural, gastronomic, leisure and business opportunities and welcomes all visitors. Discover the coolest and most glamorous nightlife of Madrid, if you dare. PRADO SANTA ANA has 4 balconies. Carmen is a wonderful host! She was able to give us great recommendations for our stay, just ask! This flat is located close to markets, the metro, restaurants, shopping and museums. We loved the little balconies, opening the doors gives some great fresh air. We were 4 adults staying together and there is plenty of room. Amazing apartment in Madrid! Close to everything! This small apartment in Madrid was fabulous! I stayed here for three nights with my mom and sister. The apartment was well appointed with everything you could need. One bedroom had two twin beds with an en-suite bathroom and the other bedroom had a queen size bed. There was another bathroom in the hall. The kitchen, though small, was perfect and they even had coffee for us to make! This was perfect for me, as I cannot get going in the morning with out a cup! The apartment is also close to everything and in a very safe part of town. (Although, to be honest, we were out until well past midnight all three nights in the city and not once did we feel unsafe or wary. I think Madrid is probably a very safe city). The Prado is a 5 minute walk, Buen Retiro Park is 8 minutes and the Plazy Mayor is about 12 minutes. We walked everywhere from the apartment and the most we walked was probably 25 minutes to get to the Palacio Real. Carmen, the owner, was super helpful and charming. She met us at the apartment to let us in and walked us through everything. She also gave us a city map and pointed out best routes to get places and offered a few suggestions for food! Also, I left a few small items in the apartment when we left and called her once I realized. She grabbed my items and mailed them to me quickly. I am so grateful to her! There are a ton of cafes, restaurants, bars and markets right around the apartment. We ate in the plaza directly down from the apartment and enjoyed the night performances and music. Our last night we ate at Lamucca, which you can see from the apartments balcony. It was delicious and it's location is superb if you need something extremely close. You will not regret staying at this wonderful apartment on your next visit to Madrid. I just returned from my trip to Madrid with 2 friends and couldn't wait to write this rave review! The apartment is adorable and had plenty of space for the 3 of us. The 2 bedrooms were great and having 2 bathrooms gave us enough room to have our own space. The showers had excellent water pressure and detachable showerheads. The bathrooms came equipped with sufficient hair dryers so I didn't have to travel with my big American hair dryer. The apartment was very clean and stocked with everything you need in the kitchen. The balconies were a great way to see the street activity and enjoy a glass of wine in the sunshine. We loved the character of the brick walls, shutters and beams (and the flamingo we named Francisco). The floor to ceiling wood shutters truly shut out all street noises and light. Carmen was so accommodating and easy to deal with. She even let us check in early after we arrived on a morning flight because the apartment was vacant. The location was PERFECT!!! We could walk almost everywhere. There is a great square - Plaza Santa Ana - right down the street where we often went for a quick drink or tapas at the many restaurants, We were also very close to a fabulous Flamenco show. Just a short walk to Puerta Del Sol, Plaza Mayor, Gran Via, the Prado, Retiro Park and Atocha Train station. We couldn't ask for easier access that all Madrid has to offer. I hope to get back to Madrid and stay here again! We had a great stay. Lovely area to walk around. The villa was clean and beautiful. We would stay here again. Central to everything you need in Madrid. Great neighborhood. We will return.